Spanish painter. He was the pupil of Aniello Falcone in Naples, and Juan de Toledo in Madrid. He excelled in painting battles and executed several altarpieces for churches. Prez Sierra was an able figure painter who appears to have all but abandoned his career as a professional artist to live on a salary from the bureaucratic office he occupied as Agente General de los Presidios de Espana. 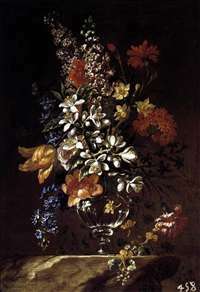 His biographer, Antonio Palomino, knew Prez Sierra in his later years and writes that he dedicated himself in an amateur capacity to the painting of the flowers and fruits that he grew in his own garden in Madrid, on the Calle de las Infantas. 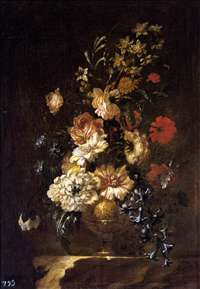 He also appears to have had a close friendship with the flower painter Gabriel de la Corte, at whose wedding he acted as a witness.